Good health for your dog and cat often starts at…well, the beginning. That is your pet’s mouth. Often the first time the pet owner really thinks about the mouth is when they get a good whiff of their dog or cat’s breath. It can be anything from a slightly gamey smell, to a sour smell, to a terrible sewer-like smell. But, because the health of the mouth truly affects the health of the whole animal, the odor may just be the tip of the iceberg. Your pet’s routine general health exam will include an examination of the mouth to the extent your pet will let us look. 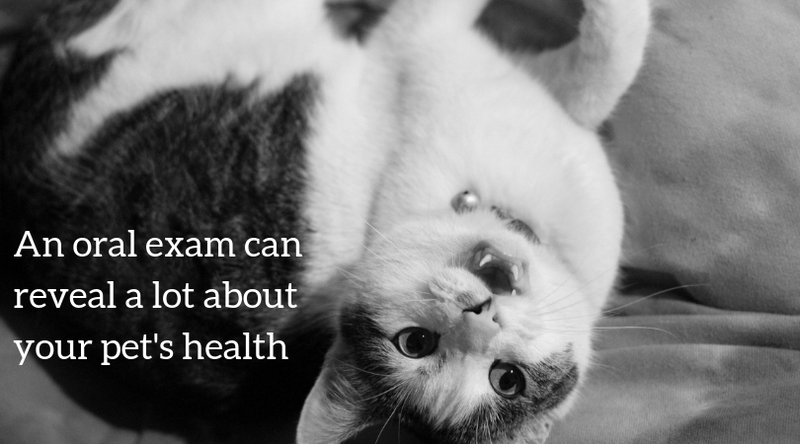 As most cats and dogs do not like having their mouths held open, we often make an assessment based on as much of the mouth that we can see while still keeping your pet as comfortable as possible. However, that overview can tell us most of what we need to know. If we need a longer look, we will recommend a more thorough examination under sedation, with or without dental cleaning. Dental cleanings are done under general anesthesia. We are passing an ultrasonic scaler over the surface of the tooth to remove tartar and debris, which is then washed away with a light stream of water. Areas around the teeth are probed for defective attachments, called pockets; evidence of infection; and mobility. Broken, detached, and loose teeth cannot “grow back” or become reattached. They become very painful and allow an infection to move into the bones of the jaw or under the sinuses. These teeth need to be removed to allow the mouth to heal. Finally, the teeth are polished to create a smooth surface resistant to new rapid tartar formation. Many conditions in the body can be worsened by an infected or unhealthy mouth. The kidneys, liver, skin, joints, and heart can all develop infections from the bacteria in the mouth. Your pet can suffer pain and poor processing of food if the mouth is painful. Bacteria can even be transferred to owners and children’s skin. Your pet may not be able to let you know if their mouth hurts, and they may not show easily recognized signs of pain. So, good loving care of your best friend starts at the mouth. Let us help you give them the best life and health possible. Contact us for your pet's next dental exam and cleaning!